I preached tonight at the Bethel Baptist Church pastored by my friend Pastor Dominic Pennachietti. The building was full and the spirit was great! The altars were full at the invitation time. I preached the sermon, “Every Thing Rises Or Falls On Followship.” The people were extremely receptive. This is a great church with a great pastor and staff. Tonight sitting on the second row was two of our TEXAS BAPTIST COLLEGE graduates. 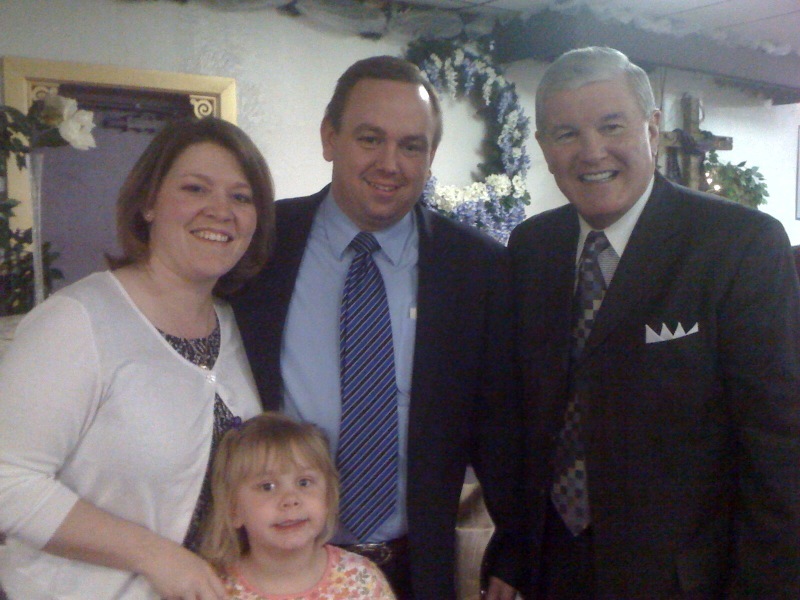 Pastor Josh Doster and his dear wife Wendy with their daughter Emma. Pastor Doster is a 2003 graduate of TBC and his wife Wendy is a 2001 graduate of TBC. They were married in 20002 and God has blessed them with a sweet little girl names Emma. Pastor Doster worked with his dad Pastor Jim Doster at the Lighthouse Baptist Church of Gloucester, NJ. He and Wendy then went to work as a Youth Pastor in Barstow, CA., for a while and have recently returned to accept the pastorate of the Bible Baptist Church of Clementon, NJ. The Lord has certainly blessed our TBC grads. We have over 400 graduates serving around the country and world. Thank the Lord for them! By the way, you don’t have to worry about the King James Bible being criticized or corrected at TBC. When you send your young people to TBC you can rest assured their faith in the KJB will not be shaken! Gotta love serving the Lord!